The greatest desire of Kiyohira, who moved his residence to Hiraizumi and came to rule the Tohoku area, was to create a peaceful society. 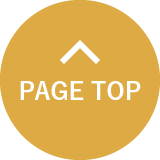 Due to this, he started construction of Chuson-ji Temple for the purpose of reposing and mourning all the souls of the people, both enemies and allies, who lost their lives in the repeated battles. Kiyohira wrote the Prayer for the Dedication of Chuson-ji Temple (Chuson-ji Kuyo Ganmon) when he decided to construct Chuson-ji Temple. This is a written oath in which he vowed to create a peaceful country with no wars. This kind of written oath aiming to build a country that has a peaceful society is an extremely rare example in world history and communicates the strength of Kiyohira’s desire build a peaceful country. It took Kiyohira about 20 years to finish building Chuson-ji Temple and its various buildings including the Konjiki-do Golden Hall and the two-storey main hall. 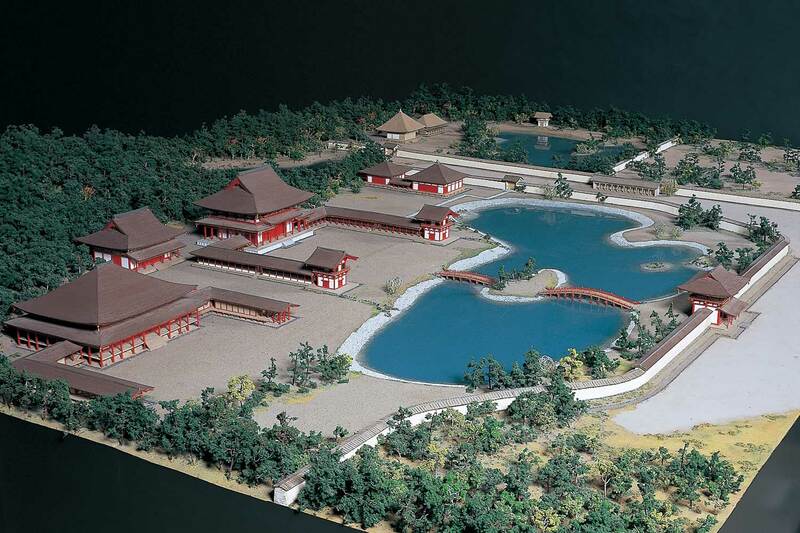 A pond and garden were also created during these years too. 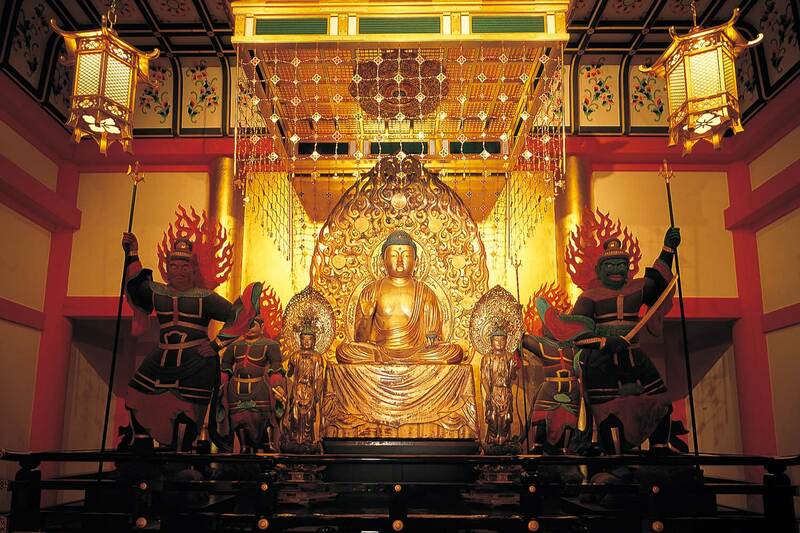 Kiyohira　summoned skilled craftsmen from Kyoto and furnished Chuson-ji with Buddhist images, Buddhist altar fittings, decorations inside the halls and sutras. 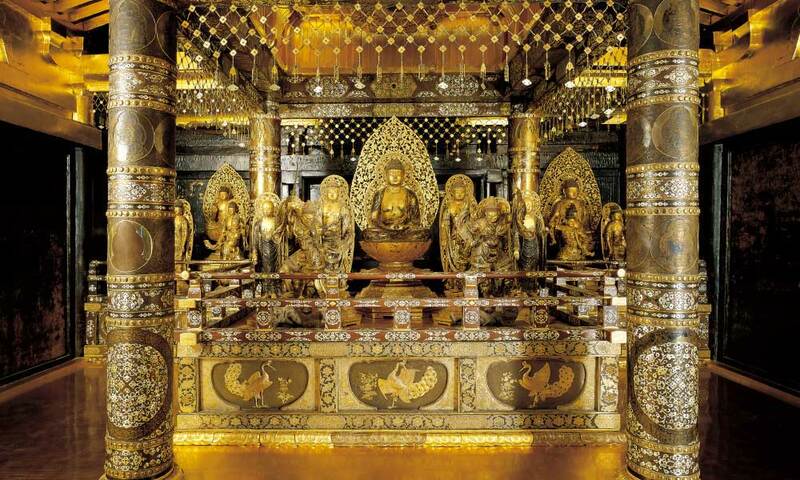 When you see the decorations inside the Konjiki-do Golden Hall, the Kondo-keman (Muromachi period Buddhist piece of art) or the decorative sutras (Konshi Kingindei Issaikyo) made with gold and silver, you gain an understanding of the high level of the skills and techniques used at that time. 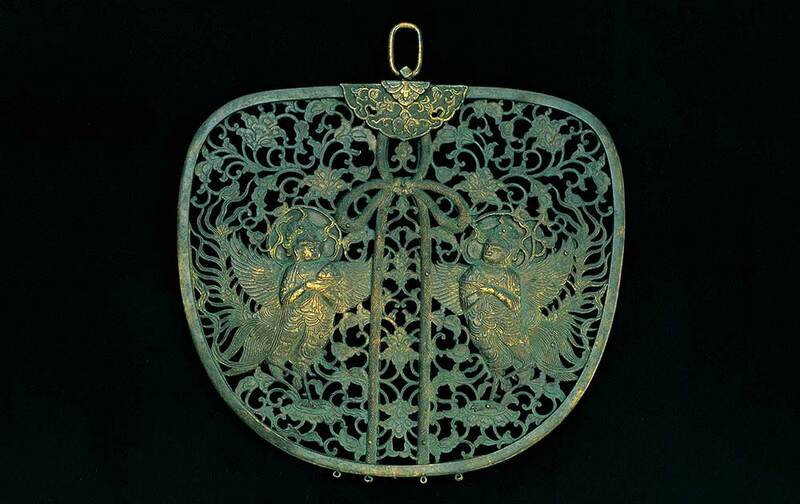 The remains of the Hondera village estate given to the priest Jizaibo Renko, who completed the decorative sutras (Konshi Kingindei Issaikyo) made with gold and silver, by Kiyohira when the priest became responsible for looking after the scripture house, lie in the main temple district in Genbi, Ichinoseki. 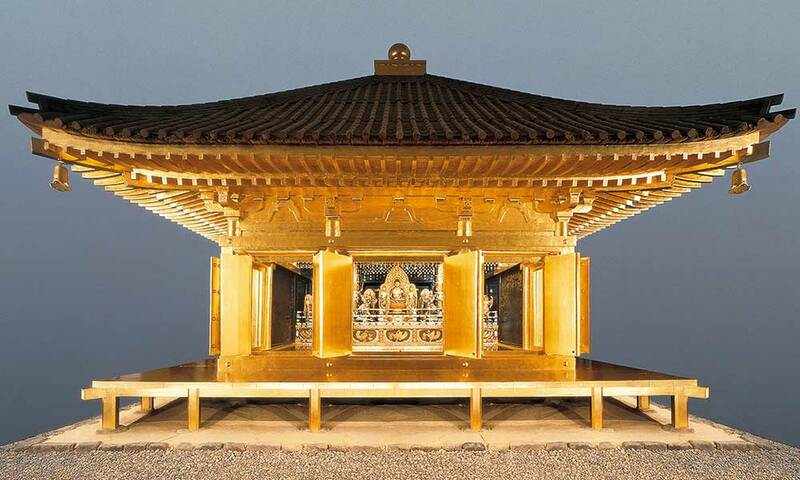 The inside of the Konjiki-do Golden Hall is decorated with gold and mother-of-pearl work to the point of being dazzling. Restoration and repair work finished in 1968 restoring the hall’s appearance to that of the time it was built. The remains of three generations of the Fujiwara clan and the head of Yasuhira are interned here at the center of the shumidan (altar) which is in the design of a peacock. This keman (altar fitting) is on display in the Konjiki-do Golden Hall. There is a Karyobinga (sacred bird) engraved in the center of the keman. 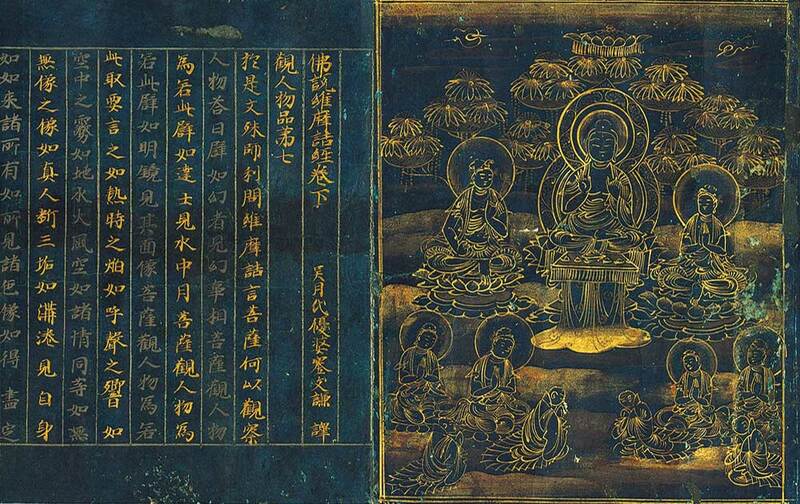 This is a decorative sutra with alternating lines written in gold and silver. It’s known as the Chusonji-kyo Sutra and it used to be stored in the scripture house. Motohira was the successor after the death of Kiyohira, the founder of Hiraizumi. Motohira further developed the town of Hiraizumi centered on Buddhism as envisaged by Kiyohira and making use of the abundant amount of gold mined here and the rich assets obtained through trade, he constructed Motsu-ji Temple. It is written in the Azuma Kagami, a Japanese medieval text, that the temple buildings of Motsu-ji Temple like the Kondo Enryaku-ji Temple of the main building were beyond comparison in Japan. In present times these buildings are no longer standing due to two fires in the past. 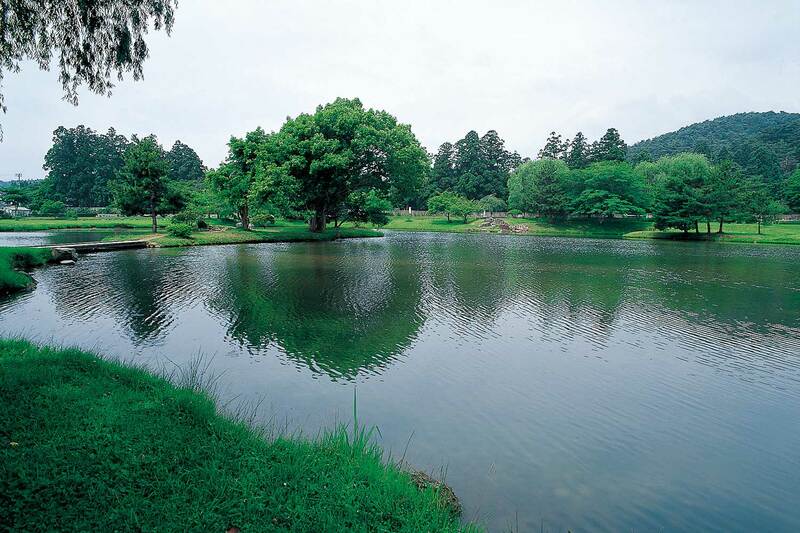 However, the foundation stones and the Jodo garden with Oizumiga-ike Pond at its center give a sense of the appearance of the temple of those times. In order to make the principal object of worship at Enryaku-ji Temple, an image of Yakushi Nyorai, Motohira requested the services of a Buddhist image maker in Kyoto. 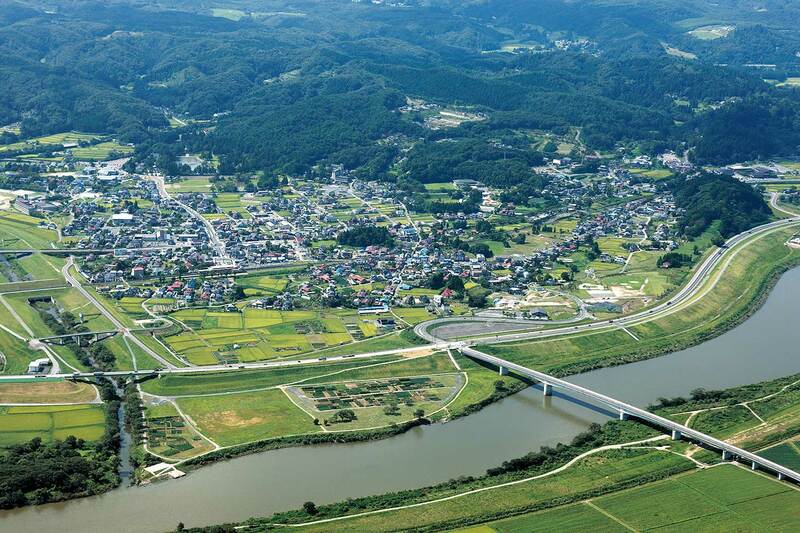 It is said that Motohira sent many goods as tributes to Kyoto during the 3 years it took to complete the image. Cloistered Emperor Toba after hearing rumors of this image was so surprised at the excellence of the craftsmanship of this image of Yakushi Nyorai that he attempted to forbid it leaving Kyoto. Such a wonderful Buddhist image it was. Kanjizaio-in Temple said to have been built by the wife of Motohira was located next to Motsu-ji Temple. The temple gardens have been recreated and it’s now a park. HIdehira was the successor after the death of Motohira. Hidehira finished Motsu-ji Temple that Motohira had started building taking Mt. Kinkei as its reference point. 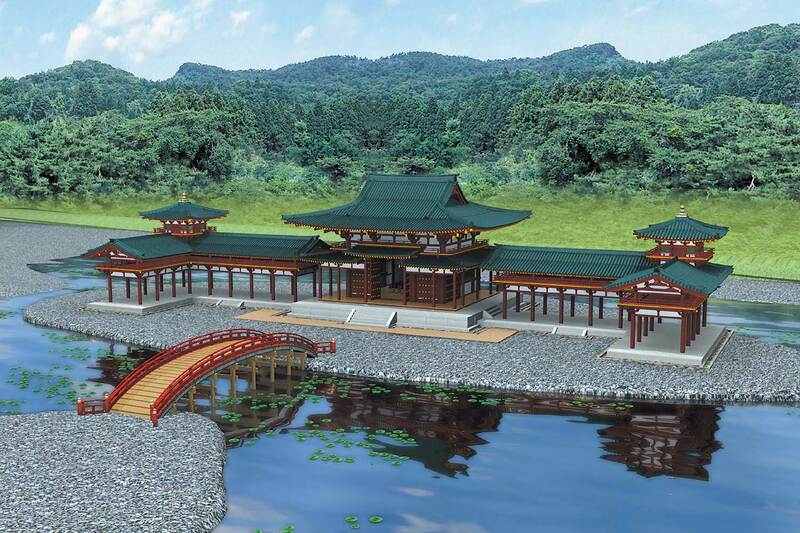 After this, he built Muryoko-in Temple which was built in the image of Hoo-do Hall of Byodo-in Temple in Uji. However, Muryoko-in Temple was said to have been larger in scale. 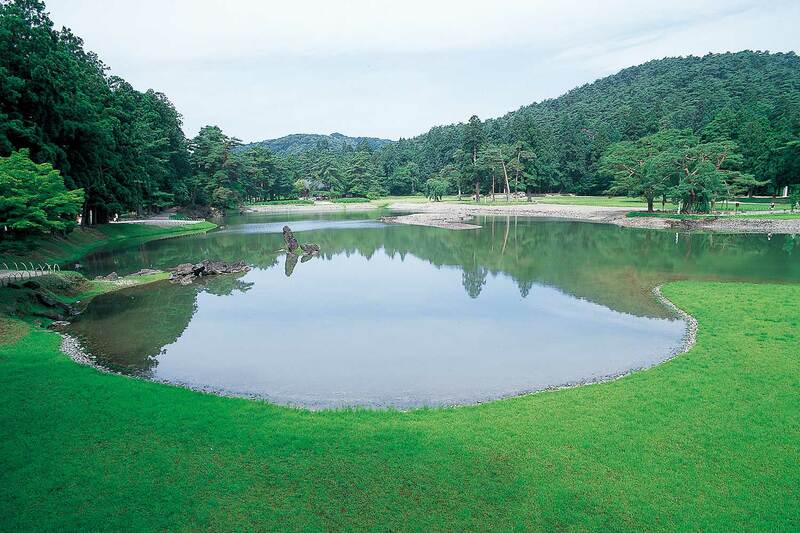 Hidehira carried out large-scale development works including at Yanagi Gosho (Willow Palace) centered around Muryoko-in Temple and completed the construction of the city of Hiraizumi. The reason Hidehira was known as the King of the North Country was due to his unsurpassed economic strength and his ability to rule Tohoku. Kiyohira and Motohira gained the top ranking of Oryoshi (government post for policing and military affairs) as a powerful family of this area. However, Hidehira surpassed this becoming Chunjufu Shogun (commander-in-chief of defense of the north) and finally was appointed Mutsu no Kami (governor of Mutsu Province). In present times this position would be equivalent to being governor of all 6 prefectures of Tohoku. In name and in practice, Hidehira became the ruler of the Tohoku area. Mt. 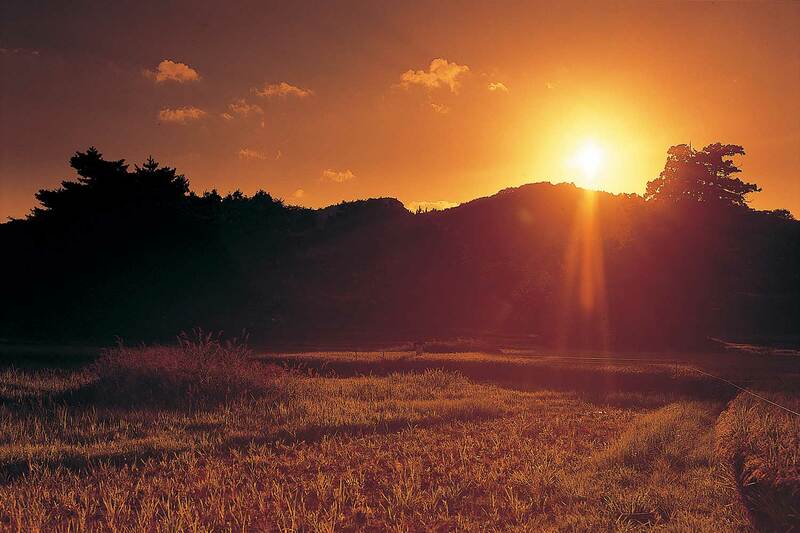 Kinkei is said to be a man-made mountain built in one evening by Hidehira and that he buried a golden male and female pair of chickens on its summit to watch over Hiraizumi. In the winter of 1187 when Minamoto no Yoshitsune chased by his older brother Yoritomo had once again sought refuge in Hiraizumi, Hidehira died of illness. Yasuhira, who succeeded Hidehira, gave in to the pressure from Yoritomo who threatened to attack Hiraizumi if Yasuhira helped Yoshitsune. Yasuhira attacked Yoshitsune and forced him to commit suicide. After confirmation of Hidehira’s and Yoshitsune’s death, Yoritomo finally sent an army to Hiraizumi. After this, Yasuhira fled from Yoritomo’s army and sought refuge in Akita. However, in the end he was killed by one of his retainers. This was the end of the Oshu Fujiwara clan. Following this, Hiraizumi’s temple buildings were burned down in a series of wars and wildfires. Most of these buildings were never to be rebuilt.